Maybe you are aware of Adobe Bridge software and most likely own it BUT do you use it? If you don't, I recommend that you start immediately. Bridge is a great tool for accessing all of Adobe's software, for finding and organizing all types of files, and much more. It is included with most Adobe software including Photoshop (PS), Illustrator (Ai) and Creative Suite (CS) so you already have it if you own version 2 and above. So what is so great about Bridge? To see, watch "Adobe Bridge Tutorial - Why use Bridge?" Bridge can be used to access all of Creative Suites software, find files, batch rename files, organize files such as assigning colored labels or star ratings, and edit metadata, keywords and IPTC* information embedded in the file. It can also create pdf contact sheets and flash slideshows with version 4 and above. Below are links to video tutorials on how to use some of these features. "Batch renaming with Bridge CS4" This method can also be used with Bridge CS2 and above. "Photoshop Tutorial: How to batch resize / save as jpg (In-Depth) Beginner" Batch resize can be done in PS without Bridge but there is an advantage by organizing files in Bridge before switching to PS to do the batch resizing. 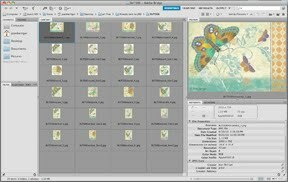 "Learn Adobe Bridge CS4 - Working with metadata and keywords" Using metadata and keywords in files is a useful way to organize files. However, I do not recommend publishing files on the web with this type of embedded information. Web crawlers can easily use this information to upload these files into public domain art sites. The more difficult you make copyright infringers to find your art, the less chance your art will be stolen. "Create A Flash Picture Gallery With Adobe Bridge CS4"
"Amazing hidden features in Adobe Bridge CS5 and CS4"
*IPTC is a scheme for metadata standards developed in the early 1990s by The International Press Telecommunications Council for photographs. It contains information of the creator, contact information, file description, keywords, and copyright. Note: It is advisable to embed at least the creator, and copyright information in all art files to protect against copyright infringement. Go to File/File Info of the opened document in PS and Ai to enter the data or use Bridge to append the information. See item 4 (below) for a description on using metadata templates to quickly append information to files. The following are reasons why I find Adobe Bridge indispensable. 1. I have thousands of art files and nearly forty thousand digital photographs that I have taken for reference. Some files are stored on my computer internal drive and some are stored on various external hard drives. Managing and naming all those files is a horrendous task and I must admit I haven't always done a stellar job. Thus, locating the files that I need can sometimes be difficult. With Bridge, I can select a likely folder on any of my drives and thumbnail images of the files and folders appears in a window. Then by selecting an image (or multiple ones by holding down the shift key) the image(s) is enlarged in another window. That way I can see at a glance whether the file is the correct one. If it is, I simply double click on the thumbnail and it opens in the software that it was created in. The above Bridge example shows 24 thumbnail images of the files that is in one of my folders (grey background window), an enlarged image of a selected file (window at right), and format, size, mode, etc. information about that file (listed in window under the enlarged image). 2. Open a file/document in Photoshop (or Illustrator) and then use Bridge to find previously created documents of icons and designs. Without opening the document(s), drag it (them) into the opened PS document to enhance the existing art or into a new document to create patterns. Not having to open files sure saves a lot of time. Hint: If you wish to save icon/design PS documents with a transparent background, do not show the background layer while in PS and save it as PGN instead of jpg. 3. When I am sending art to clients, I want to make sure that the files are the correct document type (jpg, pdf, PS, Ai, etc. ), have an embedded color profile and copyright information, the correct color mode (RGB, CMYK), resolution, file dimensions, etc. In Bridge it is easy to click on the thumbnail image and see that information without opening the file. If the copyright information needs to be added, it can be done in Bridge. And if other information in a file needs to be edited, it can be opened and corrected in the software that it was created by double clicking on the thumbnail image. 4. As mentioned previously, it is advisable to embed metadata copyright information into art files to help protect art from copyright infringement. When art is created in PS or Ai, information can be entered by going to File / File info . . . / Description menu but it is boring to enter the same information in every file and easy to forget to do it. A trouble free way to embed important metadata information in files is to use Bridge and create metadata templates to quickly apply the information to one file or multiple files at a time. To create a metadata template in Bridge, go to Tools, open Create Metadata Template . . . and enter a name of the template and any information you wish in the IPTC Core window. Make sure that you select the box next to the entered information so that it will be saved. Note: There is a lot of information that can be embedded into files. However, I embed only the information that I consider the most important such as Creator, Creator Job Title, Creator Country, Copyright Notice, and change the default Copyright Status from Unknown to Copyrighted. In the Copyright Notice I put: © (artist name) - All rights reserved except those specifically granted herein. Contact (artist name) at (artist e-mail address) to inquire about any reproduction of this image. To apply the metadata template to a file, click on the thumbnail image or select multiple images by holding down the shift key. Then go to Tools / Append Metadata / name of the metadata template. With all of the functions that Bridge has, it is no wonder why I love it. If you haven't yet used Bridge, try it and you too may find out that it is indispensable when managing and creating your art collections. I welcome any comments or suggestions. Please write them in the comment section below. 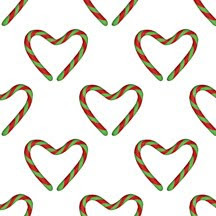 Artists that hope to license their work to the giftwrap, scrapbook, wallpaper, and fabric industries need to create repeat patterns to enhance their art collections. But producing ONLY basic and simple repeat patterns is no longer adequate. Manufacturers expect to see a variation of basic, half-drop, tossed and much more to make a collection more interesting. Below is information on how to create them. In the past, surface designers painted repeat patterns by hand but more and more are now using Adobe Illustrator. Vector software such as Illustrator allows the artist to easily alter colors, icon shapes and also enlarge icons without losing resolution. Raster software such as Adobe Photoshop is often used by artists that scan paintings into the computer and isolate icons for use in patterns. Read "What is the Difference between Photoshop and Illustrator?" to learn about raster and vector images. Below are links to video, written instruction, and e-book tutorials on how to create various patterns in Photoshop and Illustrator. Also below is a description of Artlandia plug-in software for Photoshop and Illustrator that AUTOMATICALLY creates all kinds of patterns. Some of the following tutorials use Photoshop offset, clone tool and layer mask to simplify the repeat process when creating patterns. It may seem a little complicated at first. But once the concept is understood, creating various repeats is very simple and fast to do. video - "Photoshop Tutorial: Creating Patterns/Basic and Basic-Offset Patterns"
Note: The instructions to click in the corner of the image window while the move tool is selected (in order to open the offset controls) may not work for all versions of Photoshop. An alternative method is to open the dialog box by selecting Filter/Other/Offset. video (3 parts) - "Make a custom repeating pattern in photoshop - part 1," "Make a custom repeating pattern in photoshop - part 2," "Make a custom repeating pattern in photoshop - part 3." video - using Photoshop & Second Life fashion software - "Make a Half-Drop"
written tutorial - intricate toss pattern with examples in using it on clothing "Classic Illustrator Tutorial: Create Beautiful Repeating Patterns"
written tutorial - "Creating Repeating Patterns in Photoshop Tutorial"
e-book instructions using Photoshop by Tara Reed (two available - $87 for both): "Basic Repeat Borders & Patterns" and "Half Drop Repeat Patterns"
SymmetryWorks 5 software by Artlandia is a plug-in for Adobe Illustrator. It works best with vector objects (Illustrator created objects) but also supports jpg and other raster file formats. Thus Photoshop raster images can be imported into Illustrator and patterns created with the plug-in. It allows artists to automatically create 17 repeating patterns such as all over, tossed, spot, half-drop, quarter-drop, step, sliding, composite, counterchanged, gradations. The cost is $275 for the full version of SymmetryWorks 5 and $399 for SymmetryWorks LP (version with additional features). Check out the comparison chart for more information. Note: Because the company states that the software works best with vector objects, I suspect that it may be slow when creating raster image patterns. SymmetryShop 3 software by Artlandia is a plug-in for Adobe Photoshop. It allows artists to automatically create 17 repeating patterns and supports vector images but is more limited in what can be done than what can be done in SymmetryWorks. Check out the comparison chart for more information. The cost is $341 for the full version. Note: The cost is $539 to purchase both SymmetryShop 3 and SymmetryWorks 5. I do not own either software package because I just discovered it when doing research for this article. However, they both look VERY impressive and will make pattern creation very fast and easy. I recommend that artists at least look at Artlandia website and try out the demo versions for Photoshop and Illustrator plug-ins. Also read the user comments and see what artists have to say about SymmetryWorks! Note: There are no user comments for SymmetryShop 3. Make sure that you read the comments section of this article! Artist Dori Melton has used Artlandia software and comments on problems that she had with it. I welcome any comments and additional information pertinent to this article. Please write them in the below comment section. Art Licensing Tip: What does follow-up really mean? Successfully licensing art is ALL about building relationships with the individual manufacturer art/licensing director (AD) and hopefully the decision maker. And one way to start and also to continue building a relationship with an AD is to follow-up after contacting her/him either with a cold-call or after meeting at a trade or licensing show. Follow-ups do NOT mean contacting the AD just once and hope to get a deal. In most cases, you need to be in constant contact before the AD decides to move forward with a licensing agreement even though she/he loves your art. 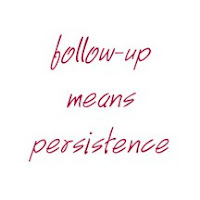 That means you need to be persistent in following-up until a decision is made. Doing follow-ups are not always fruitful and can be very frustrating when there is no response from the AD. Frequently seen on art licensing forums are statements from artists saying "I send out 100s of e-mails submissions to manufacturers at a time and I rarely get one response." Or "An AD showed a lot of interest in my art when I exhibited at Surtex but she never responded to my e-mail after I sent the art she requested." Or "An AD showed interest in my art at first and now he doesn't respond to my follow-up e-mails." ADs are very busy and they get hundreds of submissions each week. As a result, they may not immediately respond to a query or at all. Below are a few reasons why. 1. The artist sends an e-mail blitz submission to a huge number of manufacturers at one time. The problem is that some e-mail providers consider this junk mail and blocks it so that the AD do not receive the e-mail. It is better to send e-mail queries separately and personalized. Read "6 Tips in Writing Query Letters to Manufacturers that License Art." 2. The artist sends the art in a format that the AD does not bother opening. Some ADs will not open .pdf files or look at websites. They prefer getting hard copies of art or .jpg files that open automatically in an e-mail. In order to have any hope in getting a response from a query, artists should read submission guidelines if posted on the manufacturer website or contact the AD to find out how art should be submitted. 3. 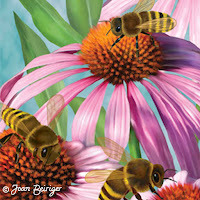 The artist sends art that is not suitable for licensing on the manufacturers products. Artist should do their homework and find out what art style and themes meets the manufacturers needs. Do not waste your time and the ADs by submitting art that is unsuitable. For instance, do not send pastel colored whimsical art to manufacturers that only license country or rustic lodge art. 4. The artist sends art of a particular theme at the wrong time. For instance, do not send Christmas images if the AD is looking for spring art. It is always better to find out the dates that ADs are selecting art for different themes such as everyday, spring, summer, fall, winter and holidays and submit art at that time. 5. The artist sends art with a style that is very similar to another artist that the manufacturer is already using. If the manufacturer is successfully selling products that has a certain art style, most likely they will not need art with a similar look no matter how wonderful the art. Of course, there are always exceptions. 1. The AD that the artist met at the show may not be the final decision maker. Even though the AD loves the art, the final decision maker may not. 2. All the art selected from the many artists at the show needs to be compiled before a decision is made on what art will be chosen. This can take a lot of time resulting in no immediate response from the AD. 3. The AD likes the art but is not ready to use it so she/he holds it until she is ready to make a decision months down the road. So how often should you follow-up? You really don't want to badger the AD do you? Well badgering is not really the right word but you do need to be persistent by contacting ADs often. Maybe contact the AD every couple of weeks at first and then monthly. Try different ways such as e-mails, phone calls, send hardcopy tearsheets, postcards, etc. and be creative until you find out what works best in getting responses from each AD. To get noticed some artists even make homemade cookies, make special greeting cards, or put their art on purchased products to send to ADs. One art licensing agent who is very persistent in doing follow-ups states that his second favorite manufacturer answer is "No we are not interested in licensing that artists work." It is the "maybe" answers that requires the most work. But no matter how much work follow-ups are, if you believe that your art is right for a particular manufacturer you should not take no as an answer. And sometimes it may take years to turn that no into a yes. Licensing agent Maria Brophy blog article "No Doesn't Mean No - It Just Means No for Now" states that it took artist Drew Brophy three years to convince a manufacturer to license his line of Drew Boogie Boards for kids. And during one of "Ask Paul Brent" teleseminars* Paul said that it took him ten years to finally convince a tabletop manufacturer to license his art. Now that is believing in your art and THAT is persistence! *Audio archives of teleseminar ask calls by industry experts can be purchased at Art Licensing Info.com including the ones by Paul Brent. The March 25, 2009 audio archive by Paul may be download onto your computer at no cost. You may signup and listen to Paul's next "Ask Paul Brent" free tele-seminar on October 20, 2010. I welcome any comments or suggestions. Please write them in the below comment section.